A few months back I picked up new record player from Target. Shortly thereafter, I sought out records at some local flea markets and thrift stores. One flea market booth had huge racks of albums with a wide variety of music. I found some Dylan and some Ray Charles, but I also found a couple punk albums like Government Issue's Boycott Stabb, and an album by a band called Volcania called L'agression. 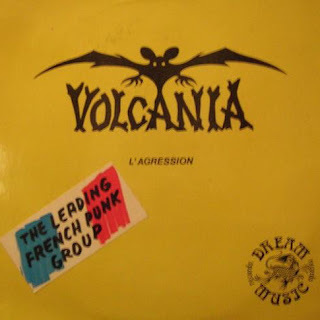 As you can see from the picture it had a goofy looking bat and a sticker on the front that said "The Leading French Punk Group." I had never heard of them, but that didn't mean anything because there are a lot of older, important punk bands that I don't know about. I put on the record and did some research online for more information about Volcania. Or at least I tried to find information about them. There weren't a lot of Google hits and most of the information was in French, a language I most assuredly do not speak. The best information on the band I could find was on a French site called the "France Metal Museum." According to the Google translation of this site, the band was formed in 1976. Apparently, the band was originally named HLM. Before they recorded in 1977, the record label, Dream Music Records, forced the band to change their name (don't ask me why). Volcania was born. The group consisted of Pierre Brusco on guitar, his brother Yves "Vivi" Brusco on bass and lead vocals, Omar El Mabrouk Ben on drums, and Thierry Van Hooland on lead guitar and backing vocals. The band, under the Volcania moniker, toured to promote the album, but it didn't sell well. Pierre left the band later that year. The remaining guys renamed the band HLM (I want to know what it means just as badly as you do) and the toured a while longer. Eventually everyone went their separate ways. Volcania didn't even last a year. Matt Canino is in awe. Members of the band went on to perform with Trust and a band called Trash. But in that year, they made an album. I did a review of the album on Punknews already but I'll go over some of my thoughts on it again. It's definitely a product of its time. Vivi has some nice aggressive vocals, a little like Iggy Pop's. The musicianship is tight. I especially appreciate the bass work and the lead guitarist, who has some ripping solos. It's a bit of a Stones and/or Who sound. My favorite tracks are the lead track "Mais C'est Seulement Du Rock And Roll" (But It's Only Rock and Roll) and Fille De Joie (Daughter of Joy). I don't understand a word of the lyrics, because, again, the French. My guess is that because they album did so poorly in France, the label decided to ship a bunch of records to the U.S. to see if their sound would fly here (not without the sticker though. It means they are exotic). I have no idea how rare this album is. When I first researched it, there were a couple up for sale on Ebay, but neither entry is there now. Also, I have not been able to find the tracks digitally anywhere. Until now. I am going to bring Volcania to the English-speaking, 21st century. Fortunately, my record player has a USB port which allows me to rip albums digitally. Unfortunately, I have no experience doing this. That means the tracks I have may not necessarily be of top quality. I tried my best. The vinyl itself is very clean for being over 30 years old. There are only a couple times that cracks are too noticeable. Otherwise, I hope the audio is sufficient. Let me know if you have problems downloading the album. Also, if the person or organization that owns the rights to this music wants me to take down the album, please let me know through my email on the left side of the page. Now, ladies and gentlemen: Volcania.